This Sunday is the Feast of the Epiphany (manifestation) of the Lord. It is a revelation not only of the child Jesus as the "newborn king of the Jews", but also that this child is not only King of the Jews, but also of "all the nations on earth." In our first reading (Isaiah 60:1-6), we hear the prophesy that Jerusalem will "rise up in splendor" and "be a light to the nations" (Gentiles). Caravans shall come bearing gold and frankincense. The fulfillment of this prophesy is what we hear of in today's Gospel reading. 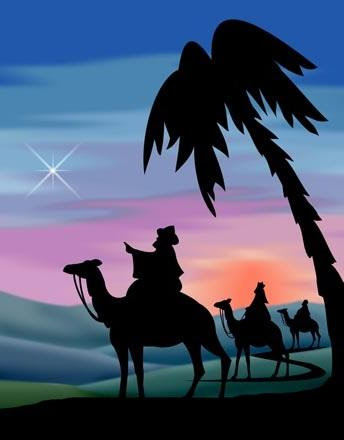 In our Gospel reading (Matthew 2:1-12), we hear the story of the Maji coming from the east coming to do homage to the newborn King of the Jews. This is a sign of the universality of Christ's mission and the future acceptance of the Gentile world that Jesus is Son of the one true God, their savior. In our Epistle reading (Ephesians 3:2-3, 5-6), St. Paul proclaims the revelation that the Gentiles are "coheirs, members of the same body". This was hard to accept for many Jewish Christians who believed that Gentiles had to become Jews to be saved.. The word catholic means universal and refers to the undivided Christian Church throughout the world. Our readings today tell us that Christ came to save the entire world, not just the people of Jerusalem; and that Christ's love and mercy would come to be known and accepted throughout the world. The word Catholic is also a call for us Catholic Christians to BE the light by which others will walk.